“Google Edition” devices seems to be the talk of the town these days with many OEM’s already on the verge of unveiling their respective flagship devices that come pre-equipped with Stock Android or Vanilla Android as its most commonly known as. With that said, HTC and Samsung have been teasing us since quite some time now with their upcoming “Google Edition” variants of the HTC One and the Samsung Galaxy S4 respectively. From what we have heard today, it looks like the wait might finally be over as both the devices are now available in the Google Play Store with shipping scheduled to start from July 9th. 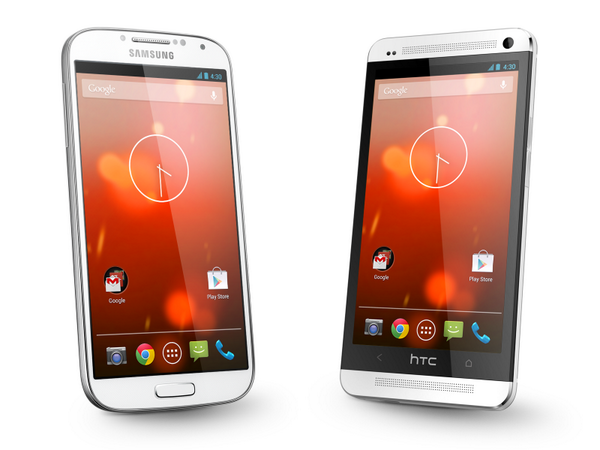 The HTC One Google Edition costs $600 whereas the Samsung Galaxy S4 Google Edition is available for $650, both devices can easily be purchased directly from the Google Play Store. An important thing to note here is the fact that both the devices would be completely stripped of all those eye candy additional features that come bundled with their carrier counterparts. User’s who opt for the HTC One would be deprived of Sense 5.0 which means no Blink Feed as well plus the camera features found in HTC’s customized UI would not be present as well. For those opting for the Samsung Galaxy S4 Google Edition would see themselves using an entirely stock version of Android 4.2.2 Jelly Bean and even though the OS does come with its fare share of perks and jazz, it still leaves a deep dark hole for people who would be refrained from trying out all the new cool features including Air View, Air Gesture, Smart Scroll etc . As they say all good things come at a price…so if you are one of those people who don’t really care about the additional features that are found in the carrier versions of both the devices and also for those who always tend to prefer using Android in its purest form, should most certainly give these devices a try. Which one would you be opting for ?